CAPTCHA’s are an irritating but necessary evil. The system that is used to verify whether or not a user is human has been around a while and it had to evolve because machines were getting better at reading the text than humans. With its latest iteration, Google says you’ll no longer have to input anything at all. 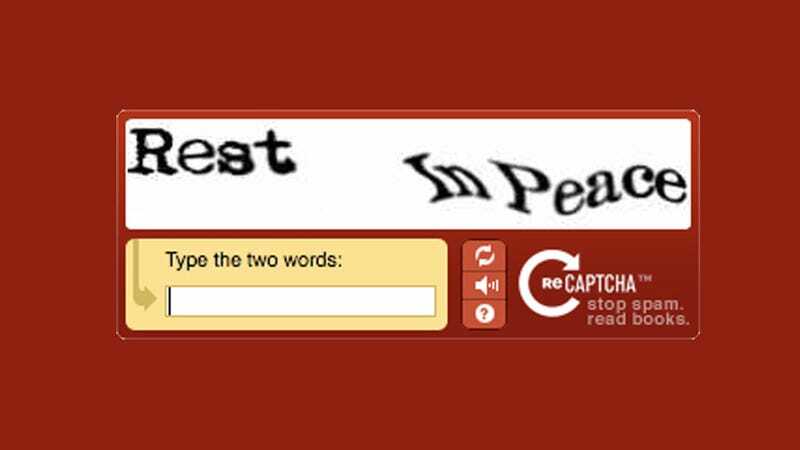 Invisible CAPTCHA’s are the latest development in the “Completely Automated Public Turing test to tell Computers and Humans Apart.” Google acquired reCaptcha back in 2009. It updated the system in 2013 to allow for the ubiquitous “I’m not a robot” checkbox that’s all over the internet. That version worked by determining the user’s humanity through their clicking style. If the click seemed fishy, a more elaborate test would be offered. But the Invisible CAPTCHA is able to recognize that a user is not a bot simply by analyzing their browsing behavior. In a video, the company explained “Powering these advances is a combination of machine learning and advanced risk analysis that adapt to new and emerging threats.” But what’s in it for Google? When the search giant initially bought reCaptcha it was actually for the purpose of integrating it into its giant book scanning project. The technology was great for digitizing books that were illegible to Google’s transcription system. But its unclear what Google gains by continuing to improve the software. Shuman Ghosemajumder, a former Google employee tells Popular Science, “Google in general—and this is certainly a philosophy that we adhered to when I was there—believed that anything that is good for the internet, is good for Google.” In this case, a “more frictionless” internet is good for everybody. But don’t count out the possibility that Google is improving its machine learning capabilities through your behaviors. And Ghosemajumder points out that Google knows about the past behavior of users when they’re logged in, which would make the system more accurate. That could be a small incentive for some people to ensure they log in.